This year has been a transitional one for me and my family, so I found myself really looking forward to reading this book. I think there are things in life that we kind of know, but then another voice articulates it in such a way that it really connects. There were several of those moments for me in this book. 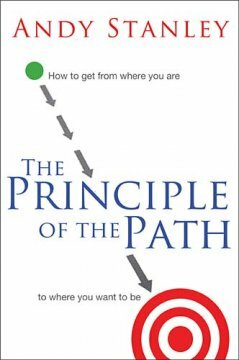 The premise isn’t earth shattering, but Andy Stanley explores the difference between laws and principles and unpacks thoughts surrounding his thesis: “Direction – Not Intention – Determines Your Destination.” Shifting our thinking about why and how we end up wherever we are in life can help us chart a better course, or path. The author contends that all of life is connected…every decision, choice, impulse, whatever…and that Todays Choices = Tomorrows Experiences. He brings the discussion to a close by suggesting that what we pay attention to, where we place our focus, will ultimately determine our destination. There are quite a few personal anecdotes and stories from scripture used to make his case. I never felt like I was being condemned for bad choices, everyone has made plenty. I was encouraged to consider the weight of even seemingly inconsequential moments in life and how they can have dramatic outcomes later on. We’re all on a path to somewhere and we can influence our destination through being intentional. I also thought it was very cool that the author was honest enough to recognize that some dreams may never be reached because of old decisions. I appreciated the fact that he took some time to help readers digest that and suggest some ways to deal with discouragement and chart a new path to finish well. There is a study guide at the end of the book that you can go through alone or in a group setting. After reading this book there is plenty of room for self-evaluation. You’ll probably want to reconsider your own direction a bit and this study guide can serve as a helpful resource. Overall the book is a relatively easy read and was definitely thought provoking for me. I will be keeping this one and probably referencing it in my personal life from time to time.